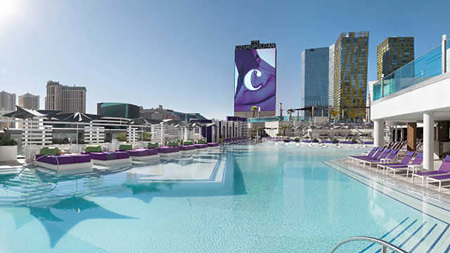 This modern luxury resort enjoys a prime position right in the heart of the Strip. Fabulously chic, the hotel offers contemporary accommodation, some with terraces from which to enjoy the views. With world class restaurants and a selection of hand-picked boutiques, a stay at the Cosmopolitan is the new Las Vegas experience! If you wish to try your luck at the casino, you'll find the latest in technology meets familiar games. In city rooms with TV, coffee maker, mini bar, hairdryer, iron & ironing board and safe. Terrace studios with an oversized private terrace are highly recommended.